MeCanto lets you take your music collection wherever you go, with virtually no storage limit. Setting up MeCanto is as simple as creating an account on the MeCanto website and installing a client on the PC containing your music collection. As soon as the client is installed, your entire music collection can be accessed through the website or on your mobile phone (using the mobile phone client and 3G/WiFi internet connectivity). MeCanto is using state of the art server technology in order to enable instant access to your music collection while your collection is being uploaded to the MeCanto servers. This way, users with big music collections can listen to their entire collection although it could take weeks for their entire collection to upload. You’ll need to sign up to start using MeCanto. # Automatically syncs your online collection with new tracks and albums from your your PC. # Instant access. Upload is done in the background; Once uploading is done, the PC application can be turned off. # Web and Mobile access. # Playlists created on the website can be accessed through the mobile application. # YouTube and Twitter integration (through the website). # No need to keep buying larger MP3 player (and mobile phone memory cards) to store your ever growing music collection. No need to delete tracks in order to free up space on your player. 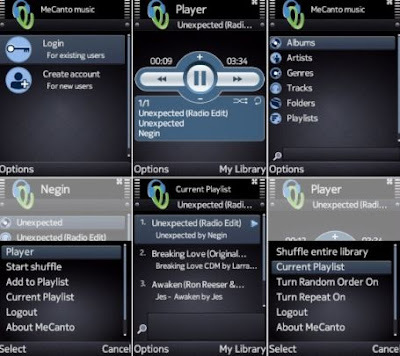 # Unified access to multiple music collection from multiple PCs. # Automatic iTunes library sync. # Just sign in and get started. # Save current track position and resume from that position when app restarts. # Improvements to pause mechanism, now pause should always work even if it’s long. # Pause playback on incoming and outgoing calls (instead of stopping it).